Rud chains are a world class premium German snow chains manufacture and are the official supplier to BMW, Daimler, Porsche and Volvo, they also make chains for just about every conceivable use. 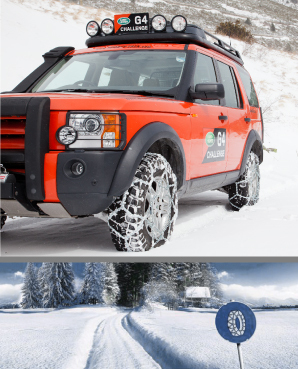 We stock their range of snow chains for winter use. Snow chains and Autosocks both have advantages & disadvantages. Autosocks have unbelievable grip for a textile alternative to chains. They are very quick to fit, remove and are incredibly user friendly. However you have to be very diligent at removing them before they come in to contact with tarmac. Fitting chains is a bit more involved and requires a little practise, ideally on your drive on a sunny day. For sheer bite from a standing start on ice and snow, chains still take some beating.